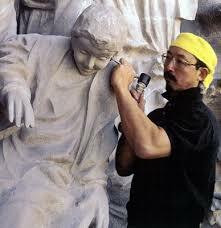 Etsuro Sotoo at work on Gaudi’s Sagrada Familia. Benedictine College hosted a Symposium for Advancing the New Evangelization in 2014. The theme was Transcendentals as Preambles to Faith, and I got to propose my take on that as a paper. Anyone who knows me could probably have bet good money I’d do something ‘three dimensional’ with that, and they’d have won those bets. We need writers and artists who can translate Truth, Beauty and Goodness into form. In that academic environment, leaders are trying to keep students from becoming flat, one-dimensional eggheads by having conferences like this where ideas are pushed down into the ground of reality and practice. In that light, my approach was to call listeners to the messy and non-ivory-tower world of actually engaging in the work of making art. You don’t have to be a great artist to get a great deal of good from learning to draw, write poetry, play an instrument. What those struggles do for you is prevent idea-olatry – the substitution of knowledge about art for the actual experience of trying to communicate ideas in real (and often inept, frustrating, messy) form. The greatest moment was when my own pastor said, “I want to get back to painting,” after sitting in on my session! Here’s an article I wrote for the great Tuscany Press site, based on this talk: Tapping Into the 3D Imagination – Realizing Person Through Art.